Firefighters continue to battle a fire at a car dealership in Crawley. 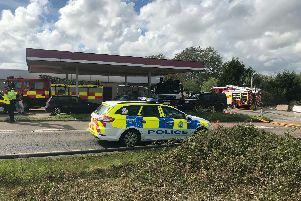 The Tesla car dealership in County Oak Way has been alight since at least 10.29am this morning (March 2), after fire crews were called to the scene. A West Sussex Fire and Rescue Service spokesman said eight fire engines were in attendance. Pictures from the scene show the extent of the damage after members of the public were advised to avoid the area due to the amount of smoke billowing from the building.